We are constantly told that sleep is important for normal functioning of our organisms. And it is true; we need around 8 hours of (most commonly) nocturnal sleep when our bodies and minds can rest and reset for the next day. Finding the proper mattress to sleep on is probably one of the most important things we can do to ensure proper sleep. If you are looking for the perfect mattress in San Diego, consider visiting Mattress Makers. So we have to sleep to function normally. Is this trait ubiquitous to all creatures, or is it just us? 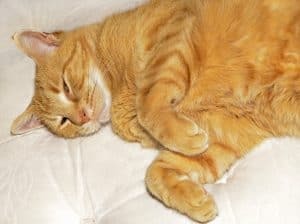 Do all animals sleep? And if they do, how do they do it and for how long? The sleep as we know it is present is some form or another in all species of mammals and birds. It can also be found in some species of reptiles, amphibians and fish, although not all species of these classes of animals seem to need it. Sleep is even present in some species of insects as well. Even those animals who do not experience sleep as we know it, are governed by the circadian rhythm. This is a kind of an inner clock which tells the animal when the optimal time for activity is, and when to lay low. This inner clock is almost exclusively governed by the sun. So, nocturnal animals will lay low when they experience sunlight, and the diurnal ones will do the opposite. In fact, animal sleep is so similar to our own, that we can identify several sleep disorders that affect humans in various animals. The most commonly affected animals are pets, but other animals can also experience them. Disorders such as insomnia, night terrors and narcolepsy prove that sleep is a common trait developed by all vertebrates. Even though it is found quite commonly in vertebrates, sleep isn’t the same for every species. It was shaped by the evolution and the environment where the species live. They have to balance between the need to sleep and the dangers of not being on alert at all times. So the duration and the ways of sleeping are different from species to species. Dolphins sleep with only half of their brain actually falling asleep, while the other half looks out for danger and performs all the necessary regular functions. After a few hours, the sides switch, so the other half can get its well-earned rest. Dolphins aren’t alone in this practice, creatures such as some bats, ducks and iguanas do it as well. These tall giants are in a constant danger from predators. It is no wonder then that they sleep very little. Some estimates guess as little as 20 minutes per day, while a more realistic figure is around two hours. And who can blame them? Their sleeping position looks fairly uncomfortable. You may have heard of this before, but sea otters sleep while holding hands. This may sound cute, but it actually serves an important purpose. They sleep on their backs in water. In order to keep themselves from drifting away from each other, they hold each other’s hands. Large sea birds such as albatrosses tend to spend a lot of time in the air. On land, they are clumsy and awkward, and it takes them a long time to gain flight again. But once airborne, these birds transform into true aces, able to sustain flight for days and weeks on end. It is believed that they also sleep during that time while flying. There are plenty of other unusual sleeping arrangements that animals make for themselves. Most people, though, prefer a nice bed with a good mattress. 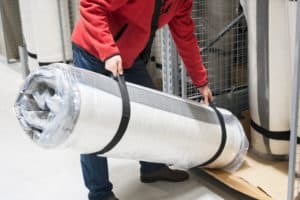 If you are on the lookout for a good mattress in San Diego, visit Mattress Makers, the best custom mattress makers in the county or check out the offer online. Be careful what you go to bed with. If you have a mattress you haven’t changed in years and you don’t wash your bedding every week in hot water, chances are high your bed is home to dust mites. 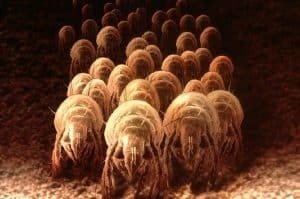 In that case, you might be providing these microscopic creatures with everything they need –a soft, … Read moreAre You Sleeping With Dust Mites?